Roses in water. This water vase of roses comes complete with Foliage. Choose the colour of roses you require. These flowers are arranged in water so all the person receiving them has to do is keep it topped up with water. 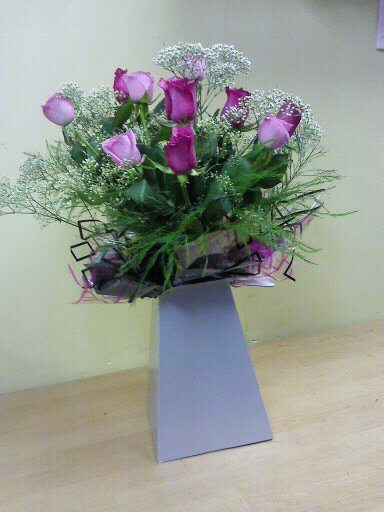 Ideal gift for someone elderly or just out the hospital or someone who does not like to arrange flowers but likes to admire the work of our skilled florists. This vase of flowers can be arranged in different sizes and colours. All flowers come with a hand written card for that extra special touch. This is a lovely gift for an anniversary or birthday.